The Ace of Spades is so last century, it's time to get aboard the Queen of Hearts bandwagon! Click here to play! Real cash jackpots could be yours if you play your cards right, and you don't even have to play cards! 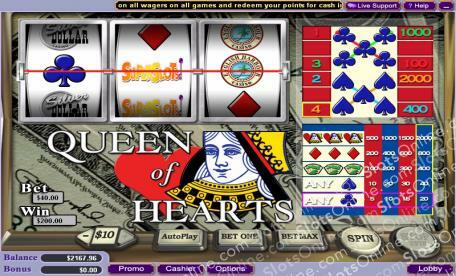 Play the Queen of Hearts slot machine today across three reels and four pay lines of exciting gaming mayhem. This traditional slot hearkens back to the days of simplistic slot machines and won't require you to do anything else but play. Clubs and Spades symbols are quite handy and can earn you a fair amount of cash. However, if you really want to win big, you will be on the lookout for the Diamond symbol, which can win up to 800 times your bet, or the Queen of Hearts, which can win up to 2000 times your initial stake! Forget about the Jokers, it's time to play the Queen of Hearts for some serious regal jackpots.